1. How big is the opportunity? The Snapchat audience is already huge. 150 million people use the service every day to send more than 400 million Snaps. That’s a bigger daily active user base than Twitter (136 million). The platform is also growing incredibly quickly. Snapchat’s US user base is projected to increase by 27% in 2016 vs. 16% growth rate for mobile messaging in general. Snapchat is expected to add twice as many new users through 2020 as Twitter and Pinterest. By 2020 at least a quarter of the entire mobile population in the United States is projected to be using Snapchat. Key takeaway: Snapchat has already established itself as one of the major social networks in a short period of time, and it’s expected to continue to grow rapidly for quite some time. 2. What is the audience demographic? Most marketers believe that Snapchat’s core user base is very young, and that’s true — for now. Snapchat has become the most important social network among teenagers. Among adults, Snapchat’s user base also skews younger. However, the fastest growing Snapchat audience is users over the age of 25. 50%: Half of new Snapchat users are over the age of 25. 2X: The growth rate of the 25+ audience is double that of the 25 and under audience. Key takeaway: Right now Snapchat is primarily used by consumers 25 and under. That said, adoption is quickly growing among older adults. 3. Are most brands using it? Many brands still haven’t taken the plunge and started using Snapchat for marketing purposes. 5% of companies say they’re currently using Snapchat as part of their marketing efforts. However, bands are curious about the service and many plan to start using it soon. 16% of marketers say they plan on increasing their Snapchat activities in 2016. 28% of marketers say they want to learn more about the platform. Key takeaway: One of the biggest barriers to adoption by brands is that many struggle to assess reach and engagement on Snapchat. This makes it hard to determine the ROI of investment. Key takeaway: Snapchat currently has relatively low usage among marketers. This seems to be changing, though, as the audience grows and the platform matures. 4. What are brands doing on it? As with any social network, there are countless tactics marketers employ to reach consumers on Snapchat. That said, there are currently two primary ways brands are using the platform. Sharing discounts and big announcements. Entertaining with fun, strange content pieces. Snap Ads: Short, vertically oriented video ads run as part of other Snaps. Sponsored Geofilters: Overlays that appear when a Snap is taken in a certain location. Sponsored Lenses: Animated filters that appear over a user’s face in a Snap. Key takeaway: While the platform can be a bit daunting to figure out at first, Snapchat already has a number of fun ways for brands to engage with audiences. 5. Should your brand be using it? So, the big question: Is it time for your brand to dive in and start using Snapchat? The answer is: it depends. If you want to connect with a youthful audience, then you probably should be engaging on the platform. 41% of all 18 to 34-year-olds living in the United States can be reached via Snapchat. The average user now spends an average of 25-30 minutes a day on Snapchat. Put simply: Younger consumers love Snapchat and they use it a lot, so it makes sense to engage them there. If your target demographic is older, and/or less tech savvy, then the situation is more complicated. Our advice for these brands is to wait and see; keep an eye on Snapchat—a very close eye—it could be essential to your business very soon. 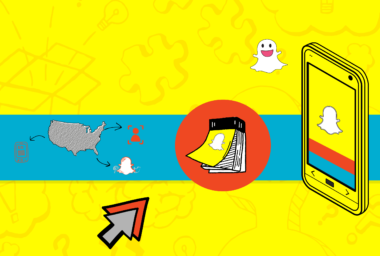 To understand how all this impacts your digital marketing efforts, check out Snapchat 101: What Brands Need to Know.